This blog post would be more aptly named "The measuring spoon project or how I got away with giving my family empty promises for Christmas" but it seemed a little wordy. Last year I gave my family a box filled with some copper wire and a few domes, telling them they had to guess the project I had in store for them. I started working on the spoons a few weeks before Christmas and realized that they would take a little longer than I expected...Little did I know it would be a year later that I mushroomed over the last rivet head and called the project done! You can see the full gallery of photos here. Five sets of finished spoons! The most frustrating (and rewarding) part of this project was the soldering involved. I spent a year without a studio set up to solder and my skills were rusty to say the least. When I got back to a fully equipped studio and started soldering again, things worked out more so by luck than skill. Most of my designs involved cold connections in part for their function, but also to avoid soldering! When I ran into issues with the spoons I packed them away to work on "later". Later came this past fall when I went to Penland for their fall concentration for two months. I took a workshop with my college professor Kristi Glick. I took the spoons with me and vowed to pull them out at least once. During the concentration I quickly recognized the deep resources of knowledge the people around me possessed. With the help of various people I gained back my skills and confidence in soldering! The spoons came together quickly once I figured out my process and set up. Above is the soldering set up that worked for attaching the handle to the scoop. Soldering is all about getting a good fit--silver solder will not fill any gaps like plumbing solder will. A t-pin held the dome at the correct angle for the handle to rest on. Firebrick was set up as a wall to reflect heat back onto the piece. The yellow paste on the spoon is yellow ocher which prevents solder from flowing. I didn't want my old seems to come undone while soldering my new ones! I loved the designing and troubleshooting involved in this project. I wanted each spoon to feature an enamel panel which meant finding a way to attach it after all my soldering had been done. I'm happy with the design I came up with but by no means do I think its the most elegant solution. I want to revisit spoons and see how I can refine my designs or try something entirely new. 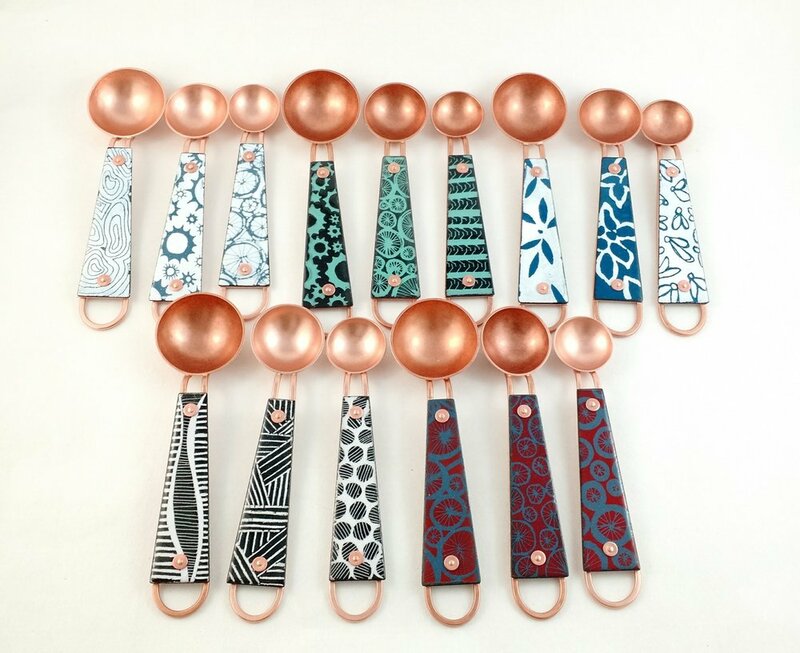 I've also found that I'm not the only person fascinated by spoons, I have a Pinterest board filled with other artists explorations of the form. Each set has a teaspoon, half-teaspoons and quarter-teaspoon. The back of each spoon is marked with the measurement.